This is a film I watched very often. 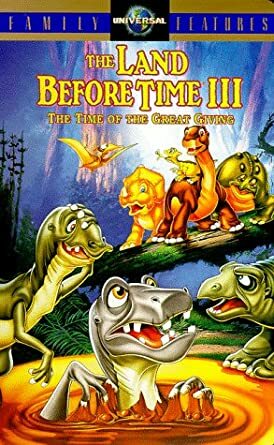 It is the first time A Land Before Time film was hyped to me before I saw it, and it had nothing to do with snow, so I knew it had to deal with internal conflict. This is the first of the Full CG era, but it is also similar to the Theme Era. Besides Journey to Big Water (9) this is the last film in the series I had in VHS. This is the first sequel to not use roman numerals in the title (on the box), the first film written solely by John Loy since The Mysterious Island (5), and it is the fifth film directed by Charles Grosvenor. For the previews I did not really care for Beethoven’s 4th, but it has a great trailer, that made me excited to see it. The commercial for Balto II is not good. Most of the film felt like it worked better in the trailer than the film. I remember not being able to tell Maizy’s gender from the commercials. The Universal Theme Parks commercial is really good. I think at least four films in the series have a commercial to Dr. Seuss’s How the Grinch Stole Christmas. I really enjoy the opening with the sun shown heating a planet and John Ingle narrating for the first time in three films. 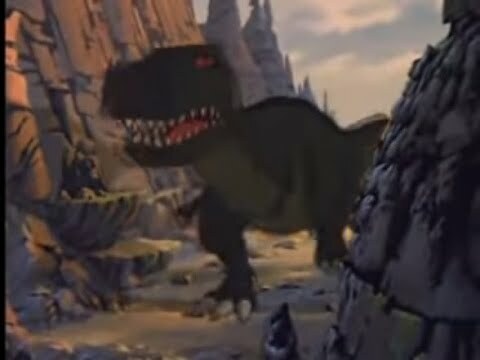 “A planet full of constant change and unpredictable weather, our home.” It also shows some small dinosaurs escaping a big sharptooth (resembling Chomper’s mom except the neck is far les detailed) and he is far from a super persistent predator. Then the internal conflict begins with Ducky getting mad at Spike for simple sibling reasons. 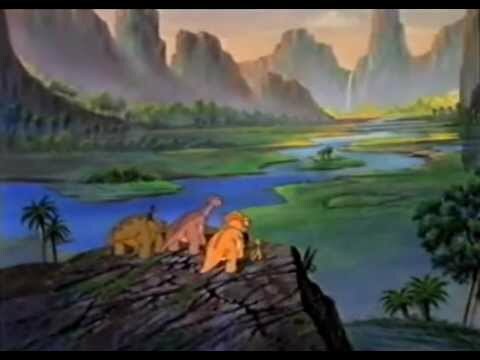 It is hard to find dinosaurs relatable but they did it here. After this we get to arguably the best guest character in the series, Mr. Thicknose. He is talking in a very sing song manner since he has told this same story over and over. 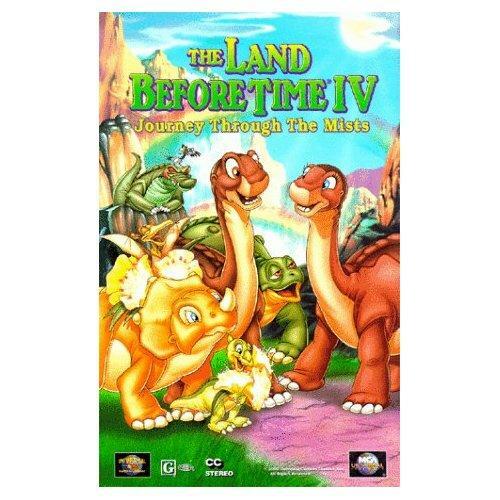 His story is from so long ago no one can remember… Littlefoot points out the obvious issues. 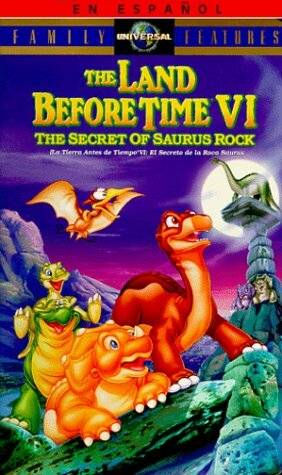 It was great to put this right after The Stone of cold fire (7), which greatly supported Littlefoot’s questioning nature. His actor, Thomas Dekker, is really good at acting like this, and it is funny seeing Mr. Thicknose try to explain, as only Littlefoot is interested. 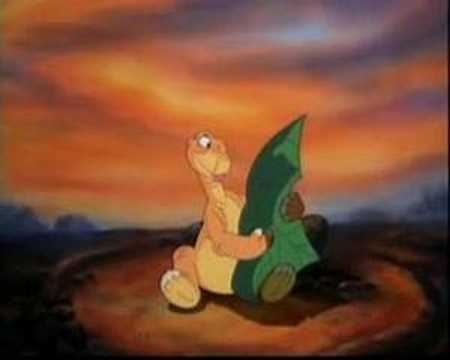 Then Littlefoot tests one of his stories to make a Chekov’s Gun and freak him out. Apparently no one else listens as closely as Littlefoot despite his tiny ears. Mr. Thicknose does not appreciate it. 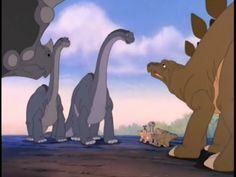 There is also more of Ducky getting mad at Spike due to sibling squabble, but Littlefoot’s and Mr. Thicknose’s problems are more interesting. Sarah then tries to help Ducky express her feelings by letting anger out. 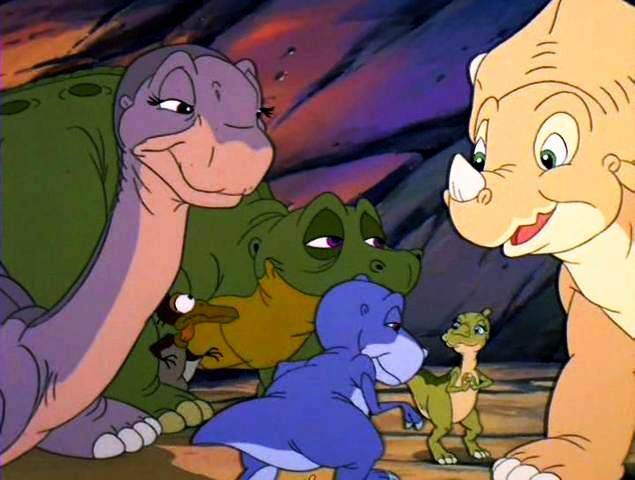 Many fans have used this to say Cera is closest with Ducky besides Littlefoot, but besides here nothing supports that. When I was younger there were a few parts of “The Mad Song” I really enjoyed like turning blue and making eyes turn red. When I got older I stopped liking it. 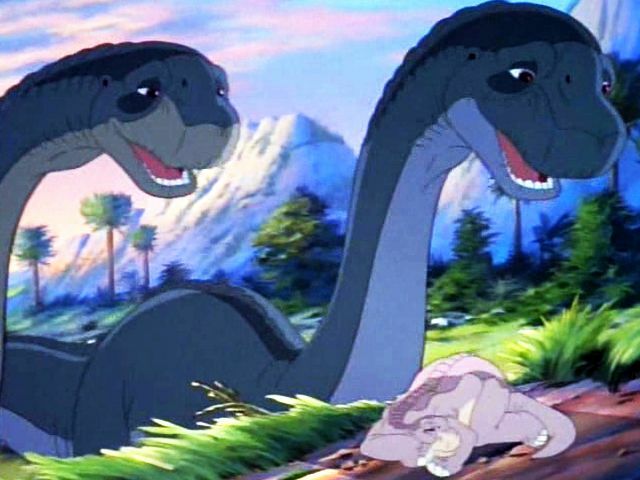 We then get back to the superior Littlefoot and Mr. Thicknose plot where Littlefoot overhears Mr. Thicknose (whom sees everything supposedly) say he is unrespectful. 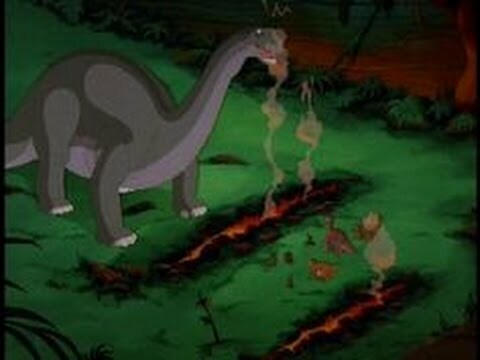 Littlefoot in a move of fridge brilliance that he is respectful thinks it must be either true or Mr. Thicknose has a problem with children. 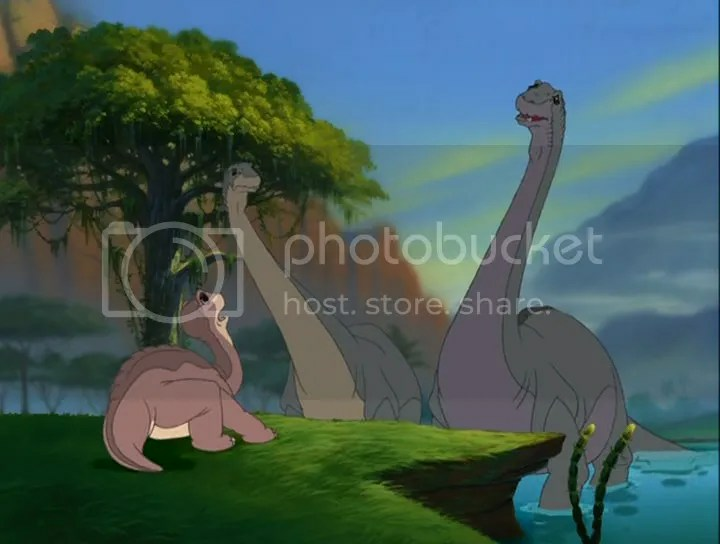 Grandpa then comes and this is my favorite part of Grandpa Longneck in the entire franchise. 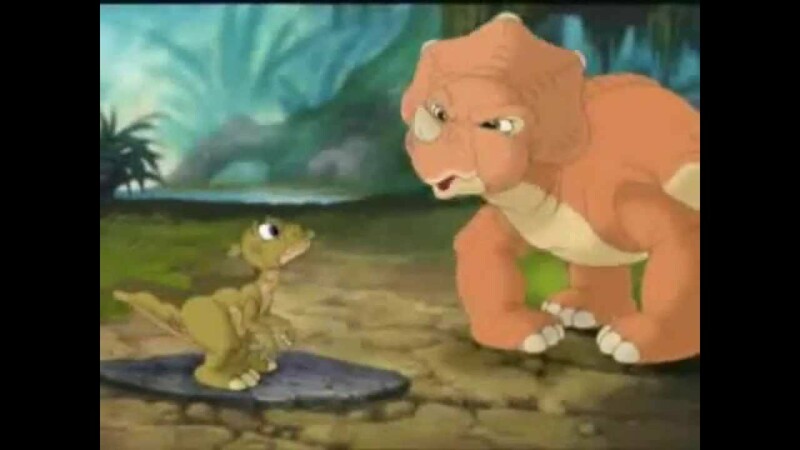 He knows option one is false since he knows Littlefoot. He knows option 2 is false, as Mr. Thicknose volunteers to be a teacher. He then tells his grandson exactly what is happening. 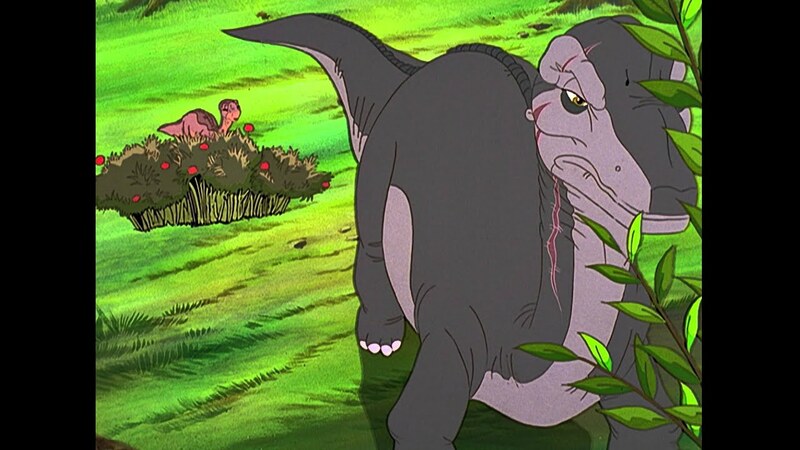 He feels Littlefoot is somehow depriving him of his dignity, which is all he has. Our third plot is introduced and it fits very good with plot number two. Spike starts to feel closer to a group of wandering spike tails than his own adopted family. Partly as Ducky is going out of her way to make Spike feel left out. The herd seems to like him for… I always presumed they liked seeing how someone born in a completely different culture has stayed very much a spiketail. It is a contradiction to say there are no other spiketails in The Great Valley, which I will try to explain as Ducky’s mom meaning none were the same coloring of Spike, thus his birth family. 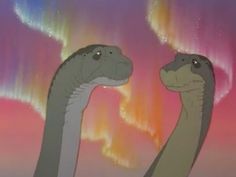 For plot number four (yikes they really connected these well) Littlefoot finds snow, but when he tells it to Mr. Thicknose (more proof of his respect) he dismisses it as something that never comes to The Great Valley. That is until it is everywhere. They then meet at the exact same meeting place as in 7, a nice touch, where the plots meet. The snow has everyone confused. Ducky is mad at Spike for spending more time with the spiketails than her. The Spiketails know the answers instead of Mr. Thicknose, and the rest of the valley is mad at Mr. Thicknose for not telling them about this. A little plot hole is we would think Mr. Thicknose was more important in earlier films like what a comet is, what to do in a drought, or warning about a plague of locusts, so I presume he was more of the resident wiseman than a leader. I enjoy The scenes of them playing even though it is odd that Ducky is happily playing with Spike. I remember I once lost a tooth when watching it. Even Mr. Threehorn joins in having a lot of fun. That is until the blizzard kills all the food, and this drives the valley further against Mr. Thicknose for not warning them (unlike the tornado he did not warn them about). How does the audience not think of that, by making Mr. Thicknose scared enough to distract them of course. 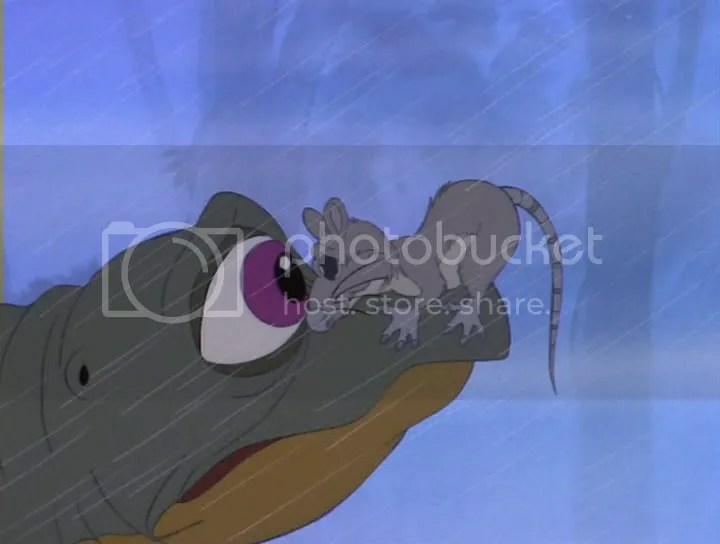 Also with the blizzard killing all the food the spiketails are leaving, which to Petrie’s surprise makes Ducky very happy. She was earlier upset abut Spike spending the night with the spiketails. When they get there it is clear that she thinks the spiketails will just leave, but they offer Spike to join them, which would seem cruel, except it seems his survival skills are better there. Spike is torn and… Here is when I wonder why I rewatch these, as I can quote them by heart. Ducky orders him to leave, as she is angry at his conflict instead of immediately picking his family. I have earlier said this is a mix between the Full CG era and the Theme Era. 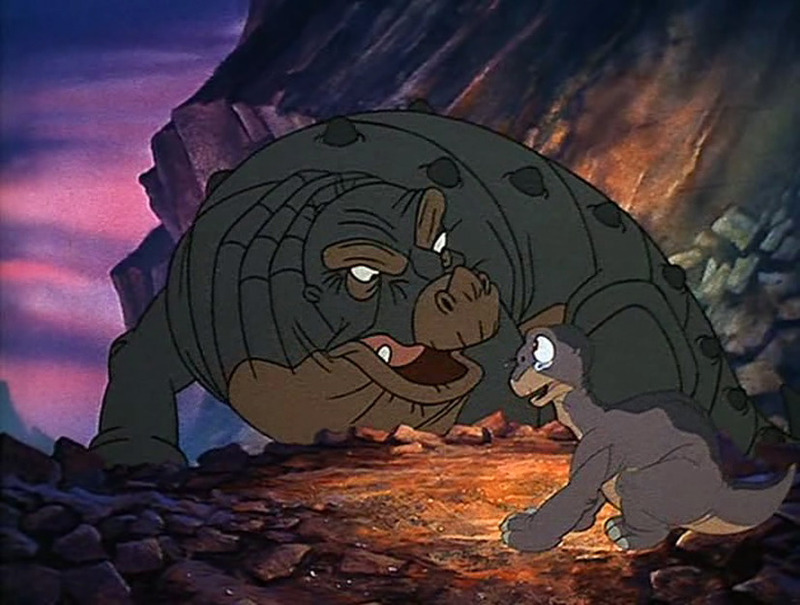 This has a heavy theme of family, and the next song is the most popular in the film, “Family.” Surprisingly it is not sung over the end credits (the original music from the end credits is used instead and the score from Pteranto’s flashbacks). I really love this song. It has good flashbacks to previous films. It also captures what it is like having siblings. After the song Ducky leaves to find Spike. The other three subconsciously make a Snow-Spike. When leaving they run into Mr. Thicknose. 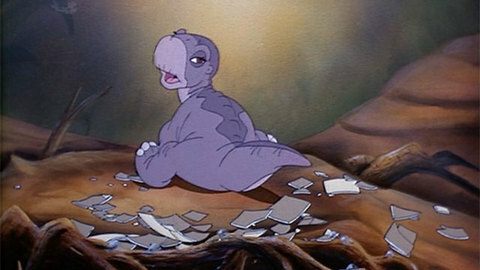 He blames Littlefoot a little for his fall from grace, but mostly himself. When he sees there are leaving The Great Valley he demands to go too. This does not make Cera happy due to his slowness. 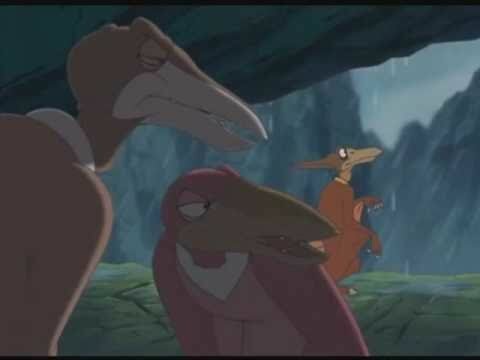 I do have to say that Petrie, Cera, and Littlefoot are working off each other really well giving some comic relief. 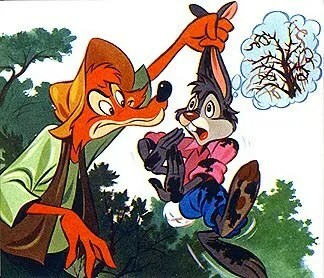 We also get to see some foreshadowing that Mr. Thicknose has never left The Great Valley. 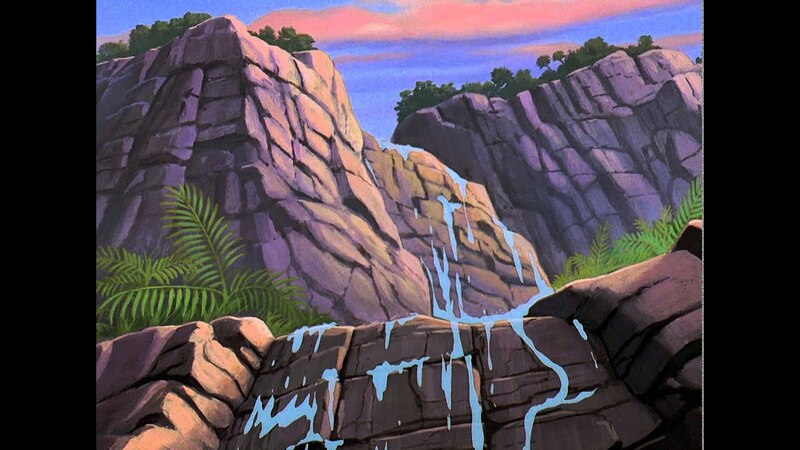 Petrie accidently causes an avalanche that removes the doorway to The Great Valley. Time to answer a question, How do Sharpteeth not get in The Great Valley when Leaf Eaters can? The sharpteeth could get in, but doing so would be suicide as anyone with the intelligence of a child could say. They would be killed by all the herbivores, due to numbers and there is only one place to enter removing any element of surprise. That is shown in both sharpteeth invasions in The Great Valley Adventure (2) and Invasion of the Tinysauruses (11). 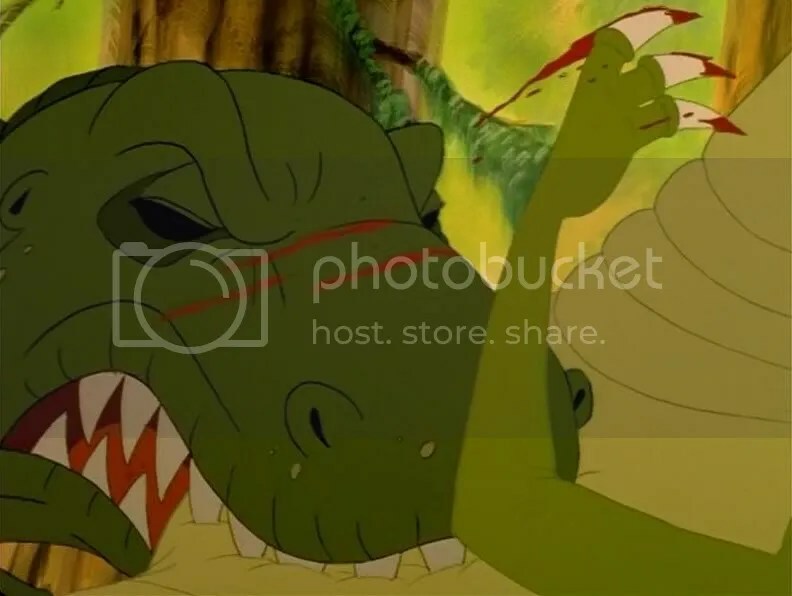 The only shown exception was “The biggest, meanest, most ferocious sharptooth ever.” After that Ducky is still looking for spike and a sharptooth finds her. 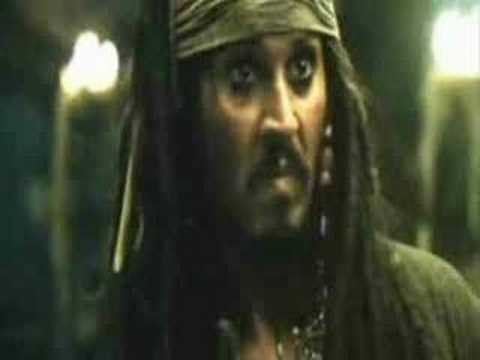 When fleeing she runs into the others minus Spike. 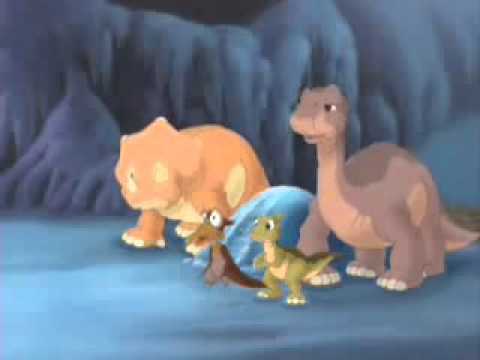 Mr. Thicknose is not helpful, and in the back but Littlefoot and Cera knock a huge snowball on him that knocks him unconscious. 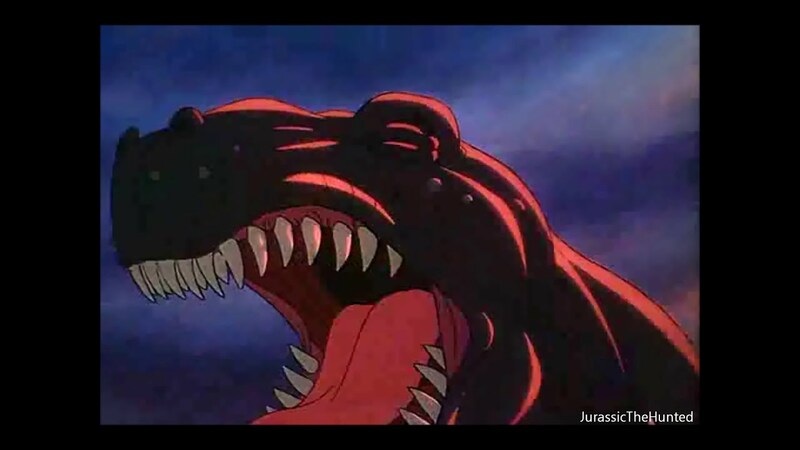 Besides some poor animation when Littlefoot calls for help this is a fine action scene. After that Ducky blames Cera for her predicament, but then she switches to herself. I like how this teaches self- analysis. The next important part is that it is further shown how with the snow killing the food everyone is starving. We then get the snow cliché of falling on frozen water, but I like how it goes from funny, to scary, to happy. It is near an underground spring with warmth and most importantly food. Most fans hate the final song, “The Lesson.” I actually really love it. I really enjoy seeing Mr. Thicknose’s explanation for his life. He heard and stole stories, and he loved how much it made everyone value him, and it was also helping most everyone. 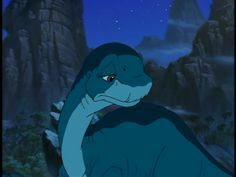 My only problems are sometimes Littlefoot’s voice sounds too girly and wondering how no one besides Littlefoot was asking about a few contradictions. After the song Mr. Thicknose remembers a few things he heard like a shortcut based on a mountain. 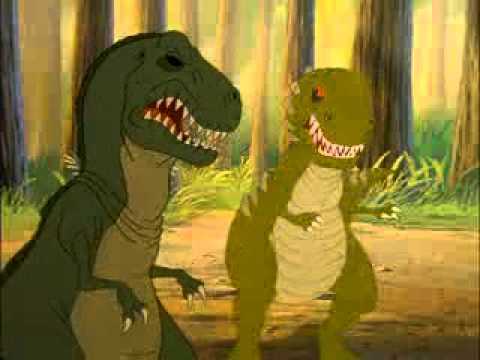 When going up they get chased by the same sharptooth. 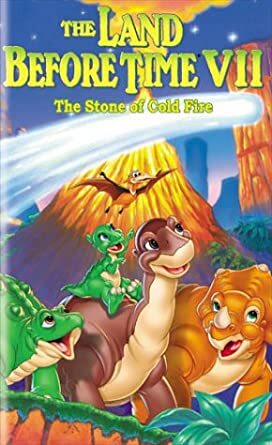 This time Mr. Thicknose is in front and the two who saved the day last time, Littlefoot and Cera, are too close to it to save the day. 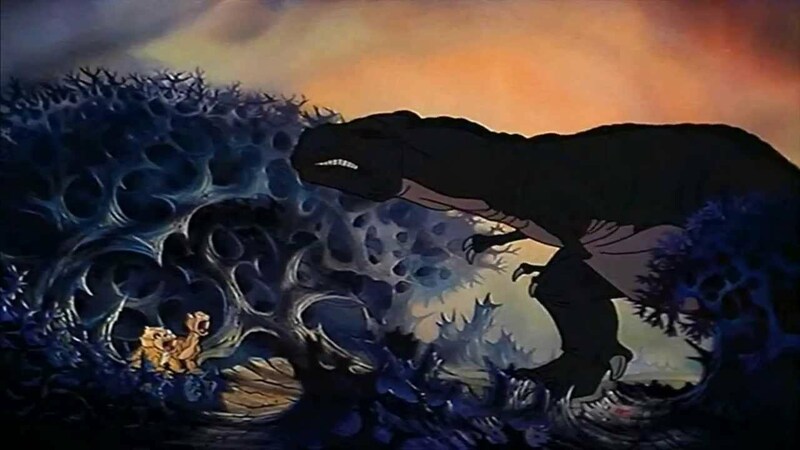 He knocks a tree on it, which the sharptooth slides down on. For whatever reason my brother and I were fascinated by it. We made a drumstick a toy and constantly made it take out our toy sharpteeth like that. They then use anger correctly by yelling at the snow enough to make the snow blocking The Great Valley’s entrance fall. 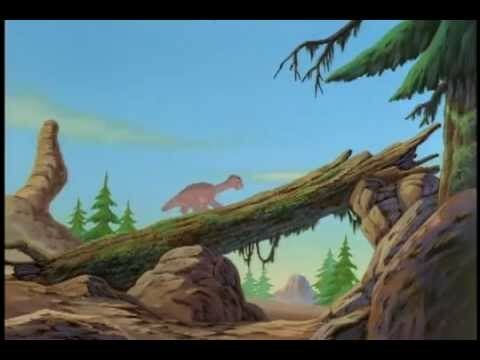 I do not like that Chekov’s gun, but I like the one where Littlefoot comes up with the idea from an old lesson from Mr. Thicknose. The Spiketails they are terribly lost until Spike smells the food and leads the herd to the rest of the group. I also like how Mr. Threehorn has developed into giving credit where it is due. Remaining plot is Spike falling through ice where the water is deep. He cannot swim (he learned by The Great Longneck Migration). 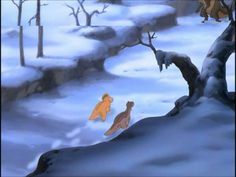 He is saved by Ducky’s mom. 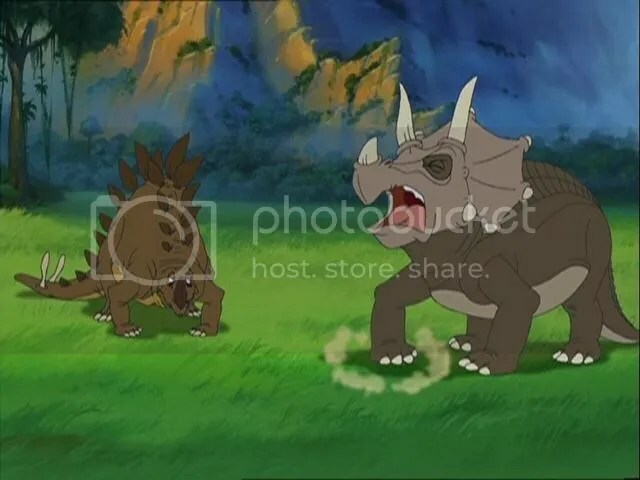 Some critics say the film did not really explore who Spike’s real family is, and they are right about this part, which is more notable for Spike saying his second word of the series, but they are wrong about the film. It goes into great length to show him not fitting into the Spiketail herd and missing the swimmers. 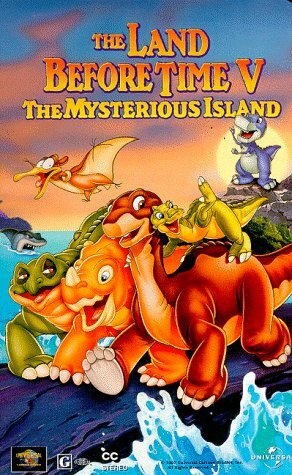 Overall I loved this at a young age and as an adult. It does not have an exciting climax, but it has really good internal conflict, good use of snow clichés and mixing it with disaster. I especially love Mr. Thicknose’s development to get more humble and less scared. 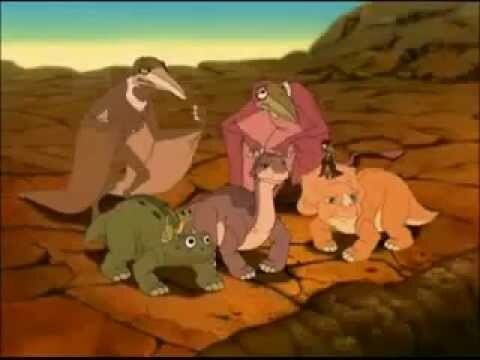 Besides Petrie all five main characters have a major role. The best songs are now 1. Bestest friends (10) 2. “The Lesson (8) 3. “Family (8) 4. Adventuring (10). 5. flip, Flap, Fly (12). 6. How do You Know (13). 7. Chanson D’ Ennui (9). 8. “Things Change (12). The new film rankings are 10, 8, 14, 12, 11, 9, 13.